I am just minutes away from leaving for the airport and the plane that will take me to NYC, where I will rendezvous with Benjamin, Cousin Chris and Mulzer - who are going to show us the city (as much as we can see in three days, anyway). So, I'll see you all next year! Cleo and Creamsicle have begun a series of border skirmishes revolving around the bedroom. Since CS arrived, the bedroom has been Cleo's sole domain, but the last two evenings, CS has decided that she wants to see what goes on in here, and maybe sit on the bed. This produces much growling and hissing from Cleo. Annoying enough when I am awake, downright maddening when it happens in the middle of the night. The other night I had to lock the bedroom door to keep out the interloper, and then again last night. In the meantime, Cleo has also started to emerge from the bedroom for business other than eating and catboxing, but only when she thinks CS is safely out of the way. I will be so happy when everyone has settled down. Oliver is back to normal, why can't everyone else just get along? The awkward feeling is enhanced this year because Benjamin departed today for Baltimore, and the APA - American Philosophical Association (or some such thing) - Conference. He has 7 interviews spread out across Friday and Saturday - so send your prayers, best wishes, happy thoughts, etc his way. Meanwhile, I am stuck at home with three cats (can we say crazy cat lady anyone?) who refuse to sit on my lap, twiddling my thumbs until Sunday when I head to NYC to meet up with Benjamin, Chris and Mulzer for *gasp* a fun mini-vacation. 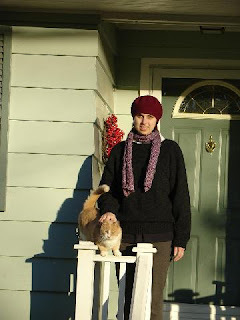 All I have planned in the meantime is cleaning house, reading (not going to make 100 books this year, but I might make 80 if I try hard enough), and finishing Benjamin's Christmas scarf (ran out of yarn on Christmas Eve - oops). I can't even treat you to pictures, because Benjamin has the camera. Merry Christmas! It is a White Christmas here in Brockport, thanks to a lake-effect snow storm last night. We are about to go out to Indian food for dinner, then a candlelight Christmas Eve service. We are thinking of all of our friends and relatives all over the country and wish we could see you all. Have a wonderful holiday! Which candidate do you match up with? Take this test and find out which presidential candidate best matches your concerns. I match up best with Kucinich, which I already knew. He is the most consistent candidate out there, with respect to his beliefs and plans. Too bad this makes him unelectable in the current political climate. Thanks to Annie for pointing out this valuable and important quiz - we should all be aware of the dangers! The above is a sort of before and after photo of what happens to toy mice that Creamsicle gets her paws on. The mouse on the right used to be the same size as the one on the left, until she eviscerated it...She sort of sits on them, like she is laying an egg, then she starts to kick them with her back claws and pulls all the stuffing out. Yikes! I know I said I wouldn't talk about snow anymore for a while, but we made a snowman yesterday - the biggest I have ever made. The snow was perfect - not too wet, not too dry, and it rolled wonderfully. 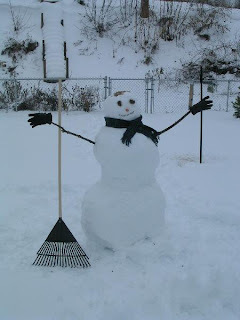 This is actually the second snowman we made - the first was on the canal walking path, and I didn't have the camera. We have both been surprised that there are not more snowmen around town. 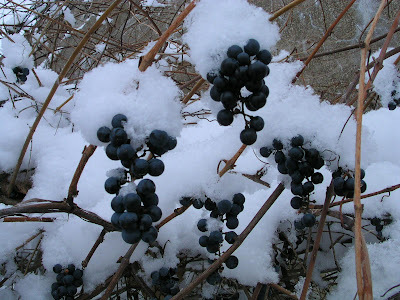 Is everyone too jaded by snow to bother? Do children not know how to make snowmen any longer? Are they too busy playing video games to come outside to play? Well, we had fun anyway. Christmas is less than a week away now - have you finished your shopping yet? 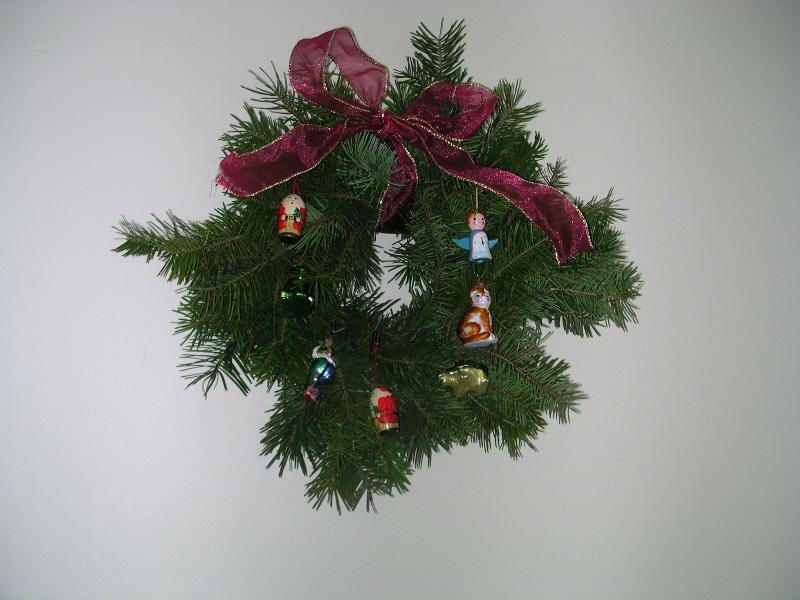 We are keeping things simple this year, and apart from stocking stuffers we are finished. Well, sort of. 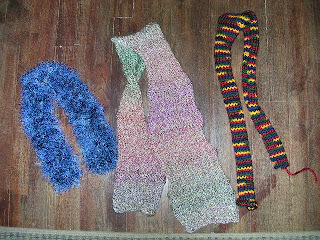 I am knitting a scarf for Benjamin, and I just started it on Monday. It isn't a secret any longer, because Benjamin is around the house all day, and walked in on me working on it. And I think Benjamin still needs to get something for his brother. But that's pretty good, because some years he hasn't started thinking about gifts until a day or two ahead of time - I have gotten a picture of my present a couple of times, since it had to be ordered and wasn't there yet. As for stockings - they were always one of the best parts of Christmas morning. My mom is really good at filling stockings with fun stuff, and my dad was always good for candy and books, and gift certificates to the CD store. Because it was usually just the three of us, we had to find ways to stretch out the present opening so that we weren't done in 20 minutes. One technique we developed was to take turns pulling items from the stockings - because the stockings were rather large and often very full this in itself could take half an hour - and then go in a circle again while opening gifts. Very civilized compared to the wrapping carnage that occurs with small children and presents. According to this article, Peter Jackson has agreed to make a movie version of The Hobbit, hoping no doubt to rake in another boodle of money. But, instead of one nice little adventure movie, he's splitting it into two movies. Huh? I like Bilbo, and don't really have a problem with the book, but does the world really need TWO movies to tell the story? Do any of you Tolkien fans out there (Annie, Chris, that's your cue) have any clue? And while we are on the subject of making boodles of money, the Mariners are raising ticket prices by exorbitant amounts - if you buy your tickets before March the amount isn't so bad, but if you wait until game day it is a lot more. And certain games against the Yankees and the Red Sox will be considered "premium" games, and therefore cost even more. That doesn't bother me so much (partially since I probably won't be around Seattle to go to those games) since it does have a precedent in other sports. Hockey, for instance. If you want to go see a good team, or rather, a famous team, like the Maple Leafs, then you pay big bucks. You want to go see a not so good team, or at least a less famous team, like the New Jersey Devils, then prices are a bit more reasonable. But making people buy tickets so far in advance to get a better price is obnoxious. And they are going to raise the price of bleacher seats too. Blech. And they think this will work? The NY Times has an article today about how Scholastic books is trying to create the next book phenomenon, now that Harry Potter is done. They have it all planned out to include on-line components, game cards and other merchandise. The books will be written by a string of different writers. It is all planned out, by committee. As someone who has read a lot of kids books, and still does, I have to say that this sounds incredibly dumb. You can't MAKE a good series - it just happens. I suppose they don't really care if it is any good...they just want to sell books and make a lot of money. Blech. We have plenty. Alas, yesterday was not officially a blizzard, and the airport only reported about 10 inches. We, however, have definitely had more snow than that, and it is snowing again, after a sunny, snow-free morning. This picture is the sidewalk, looking right (west) from our driveway. 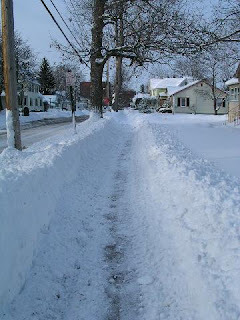 No, we didn't have to shovel all that - there is a sidewalk plow that comes by early in the morning to do that. Of course, as you can see, it leaves a ridge of snow to either side, which we do have to shovel out of the walk. The birds seem unaffected by the snow. I spotted the woodpecker, towhees, and cardinal out at the feeder. One of these days I may manage to get a picture of the cardinal in the snow. And I promise, unless we have another foot or two of snow tonight, that I will not mention snow or shoveling! Well, not officially (it has more to do with wind speed and duration than snow volume, apparently), but close enough for blogging about. So far, we have at least 6-8 inches - can't be more precise since I haven't been out to measure for several hours, and it has snowed steadily since I was out. And the snow is blowing a lot, so the depth is different in different places. Here are some pictures from the last few days - a mix of Thursday's snow and today's snow (the only difference is the amount is greater today - but snow looks pretty much the same). To the right is the view out of our front door. The plows haven't been by in a couple of hours. 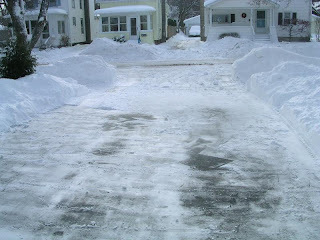 Some of the neighbors have made an effort to clear their driveways, but we haven't yet. I mean, it is still snowing, and shoveling in a blizzard is one of the most fruitless activities I can think of - and besides, we don't actually need to go anywhere for a while. Here we have Benjamin braving the cold and blowing snow to go for a walk with me. This was Thursday, but as I said, it is about the same today. I went for a walk earlier today, in case there is too much snow later. The only people I saw on my way were busy snowblowing, apart from the one intrepid jogger. I guess she also wanted to get some exercise before it was impossible. Not all of the ducks migrated south for the winter - in fact, the park across the canal still has a large number of them. I bet they were wishing they had (assuming of course, that ducks can feel regret). Quite a few of them had an accumulation of snow on their backs - I guess frozen water doesn't roll off a ducks back quite so easily as liquid water! The canal level dropped a couple of days ago - after Thursday's snow sometime. The ice on the edges cracked, leaving slabs several inches thick on the rocks. Now it is all covered in snow again and you can't really tell. Anyway, we are snowed in for the immediate future. We did all our grocery shopping yesterday, and took a trip to the library, so the necessities are covered. And we have fresh pumpkin muffins to keep up our strength. I am a big fan of learning Latin. I took four years of it in college, and just wish I could have started earlier, like Dorothy Sayers, who was reputed to have learned Greek and Latin by age 6. Maybe then it wouldn't have been such a struggle. Now, I can't say that I have a lot of use for Latin in my everyday life, but I am glad I know it. It comes in handy now and then, especially on word games. Here is an editorial essay from the NY Times that argues for more Latin education in our schools. We are predicted to get 3-6 inches of snow today, and "the first big one" of the season on Sunday. I guess the snow we had last week doesn't count as "the big one." Lots of snow is fine with me, as long as the power doesn't go out! If it does we will be toast, or rather, frozen bread. I mean, we don't have a fireplace, and while our heat is a gas furnace, it has an electric starting mechanism, not a pilot light. But, that is jumping ahead of myself. 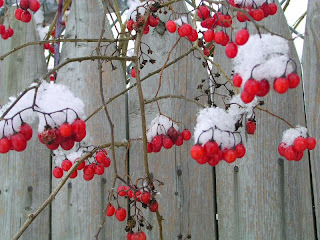 If we do get a ton of snow, I will be sure to put up some pictures. As I mentioned a week or so ago, Creamsicle has now officially joined the household. While Mom and Dad were here, she got the full treatment at the vet, and was given a clean bill of health. I wasn't going to bring her in, but it go so cold and wet that I couldn't stand to leave her outside. At first, I only let her into the basement - with her blanket, food, and litter box. For a few days that was fine for her, and she seemed content just to be inside, getting occasional petting and so on. After Mom and Dad left, however, she wanted more - she wanted to be upstairs with us. Creamsicle didn't like Oliver at first, even though he was nothing but friendly, but they now tolerate each other, and are sharing the couch as I type. Cleo is a different story - she can't stand to be in the same room with Creamsicle (unless she is eating, and then she doesn't notice anything except the food). This lead to lots of growling and hissing between the two, and occasionally at poor Oliver if he happened to be in the wrong place at the wrong time. After several days, Cleo ceded the living room except as a pathway to the kitchen, and fiercely defends the bedroom from invasion. Cleo has gotten very jumpy, and will growl at the slightest movement once aroused. During the day skirmishes are generally at a minimum, since all three cats are usually sleeping. The most troublesome time is morning. All three are awake and hungry, and all three are wandering the house. Creamsicle occasionally invites trouble by traipsing into the bedroom and invading Cleo's territory. This can lead to some very disconcerting moments when it happens in the wee hours of the night. Hopefully, Cleo and Creamsicle will eventually tolerate each other, but I am not holding my breath. In the meantime, Creamsicle is enjoying the laps, and the toys, and the food. She has absolutely no desire to go back outside, and miraculously, she has not attacked the Christmas tree yet! She is so sweet that I cannot understand why anyone would have left her behind - for she was obviously someone's pet. It is that time of year again - time to make (and eat) lots of Christmas cookies. When I was little, Mom and I would make cookies and give them to the neighbors. We always made 3 or 4 types of cookies and decorated them all. I remember it as being a lot of fun, but then, I didn't have to do the cleaning up! These days, I tend to stick to one kind at a time, and do minimal decorating. Yesterday, Benjamin and I made our first batch of the year - gingerbread shapes. They weren't men, since I don't actually have a man shaped cookie cutter. Instead, they were hearts, bells, trees, armadillos, and geese. They turned out really yummy. Once they are gone, or next weekend, I am going to try out a recipe for almond crescents that I saw in the Joy of Cooking. And 0n Christmas Eve I am going to make our traditional sugar cookies with icing - teddy bears and cacti...Good thing we played racquetball today! The sun is out today, for the first time in over a week. Even though the temperature is still below freezing (it was 17 when we got up), the energy that comes from the sun shining on the snow and ice is causing a slight thaw. The roads are bare and dry (where they were previously plowed, anyway), the sidewalks are losing some of their ice, and the gutters are dripping. The snow itself doesn't appear to be melting - as I said, it is still freezing - but clear sidewalks would be nice! I usually don't think of myself as someone who is affected by the lack of sunlight - I mean, I grew up in Seattle and didn't ever feel like I was suffering from and seasonal affectedness disorder. In fact, it is usually the opposite with me. The sun, especially in the summer, tends to get me down, with all that heat, and brightness, and the drumming rays trying to cook your brain and all that...but, after a week of grayness and blowing snow, it is really, really nice to see the blue sky again. 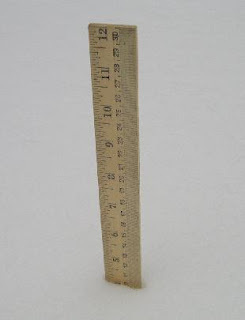 We are up to 16 inches of snow now. This morning, after the night's snowfall, all traces of our activity the day before were erased. No trail out to the bird feeder, no sign of the cleared walkway. Yesterday was gray, snowy, and gloomy. Today, the sun has peeked through the clouds in between the occasional snow flurry. When it falls, the snow falls down today, instead of sideways, as it had been doing since Monday. The birds and squirrels are out and about. The squirrels have set trails across the backyard, converging on the bird feeder. One set comes from the northwest corner, hopping from hole to hole - the bounds are quite long for such small animals, about as long as my stride. Another set comes from the east, circling a small spruce that provides a bit of shelter from the wind, and any watching eyes. Do all the squirrels use both trails, or are they different clans, only meeting at the neutral ground of the feeder? Canada geese are still passing through. They fly over in mega-flocks, aggregated from small groups, honking back and forth as they prepare to land on the canal, or take off again. They never seem to actually fly in a southerly direction - is it the same flock, circling through, day after day? No way to tell from the ground, unable to decipher their calls - do the geese from different areas have accents? The canal itself is frozen over, even under the bridges where open ice seems to remain the longest. The ice is covered with snow - hiding the remains of human activities that were uncovered when the canal level dropped - the two shopping carts, a discarded bicycle. The ice probably isn't very thick, or completely solid. It rained on Sunday evening, just warm enough to break up the ice and cause some small floes to form, and open areas that the geese filled. But that was before the temperatures dropped again, down into the 20s, and the snow started up again. Meanwhile, in the Seattle area, it is raining, and raining, and raining... Woodinville is inundated - I wouldn't be surprised if Mom didn't have to go to school today, since she works not far from some of the worst of the flooding. The Seattle PI has some amazing pictures of the flooding, here. Good thing my parents' house is on a big hill! Shoveling snow wasn't the only seasonal activity we did on Sunday. We also put up our Christmas decorations. 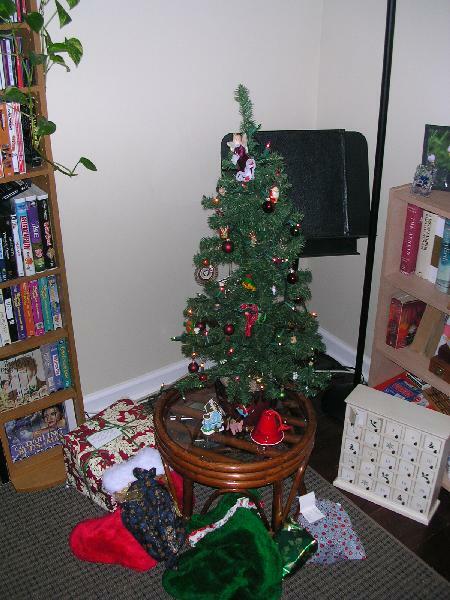 As you can see, we didn't get a real tree this year. 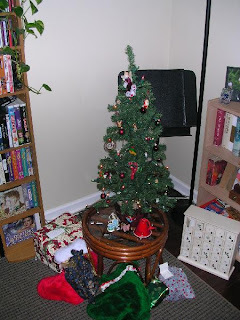 We stuck with the little tree we have used for the last 4 or 5 years. With three cats in the house - two of whom like to pull decorations off and play with them, and a wood floor, I figured it was a lot safer. And a lot less mess - no needles to fall off. I did get a real wreath though, so we get a little bit of the fir smell in the house. We went to a choral Christmas concert too, put on by the college and community chorus. A nice way to get in the mood of the season. Sunday morning we awoke to find ourselves in a winter wonderland after the first significant snowfall of the season. 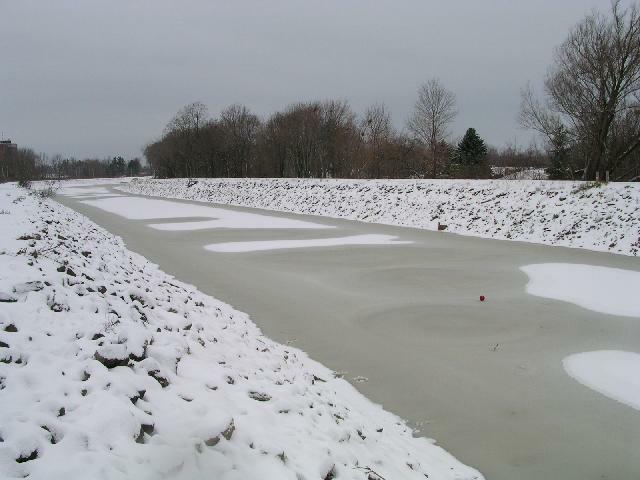 Above is a picture of the canal, frozen in places, and covered with snow. 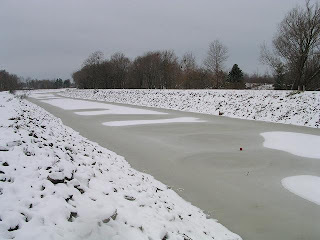 It only took one day of temperatures around 17 F to freeze most of the canal! It isn't thick enough to skate on, obviously, but it did take a biggish rock to break a hole in the ice when we were testing it. 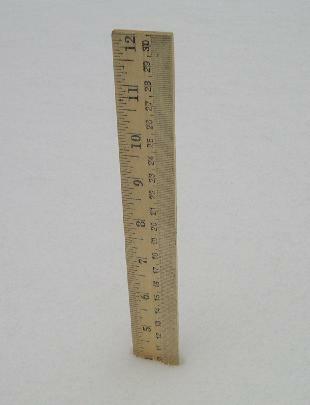 Just about four inches of snow in the yard, as you can see by this high tech measuring device. While Benjamin grew up in the frozen wilds of northern Idaho, I grew up in the more temperate suburbs of Seattle, and we almost never got this much snow at once. I think we did once when I was really little, and then I know we did when I was in 6th grade, but it happened while Mom, Dad and I were in New Zealand on vacation. Usually, that area gets about an inch a couple of times a winter, and the entire region goes into panic mode. The TV stations are all sending their poor reporters out to send live shots from "Winter Storm '07" or whatnot. Here, nothing, apart from the weather man saying we might get some more later. No reporters out getting frostbite in pursuit of the story, no crisis mode. It is refreshing. 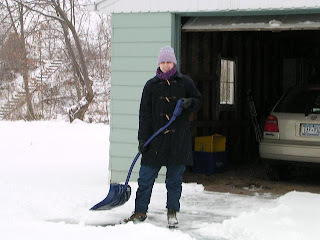 Anyway, all that snow had to be shoveled. Guess who got to do most of that? Yup, Benjamin. He is, after all, the one with experience in the job. 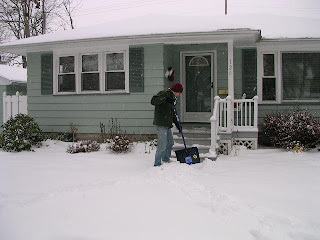 The walkway in front of the house wasn't too bad, but the driveway is largish, and there was a lot of snow on it. I did lend a hand though, for a little bit. Shoveling snow is harder than raking leaves, that's for sure! I can see how someone with heart problems could end up with a heart attack! No worries for us though. And the snow plows were out all over town, clearing the roads. There is even a special little plow for the sidewalks! It is one of those mule/gator tractor things - they are like the love child of a gold cart and an ATV - with an enclosed cab and tracks, and a small snow plow. Such fun! 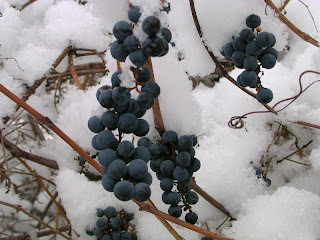 I love new-fallen snow, because the whiteness makes the winter gloom a little less, and it covers over the brown raggedyness of the end of fall. You can't see that everything is dead, all you see is a lovely fluffy blanket of white. Everything is transformed, and you can see things from a new perspective, notice things that escaped your notice before. Following up on the shower wall saga: the tiles are now set and I have begun the initial grouting stages. I was worried that the tube of grout patch that the landlady gave us wouldn't be enough, but it was, and the grout seems OK so far. I will be so very happy to have our shower back again! Especially since our furnace is not working. A warm shower would have been really, really nice this morning. See, yesterday morning we woke up to find that the bedroom was a nice, cool 57, and that the furnace was not going. If it did go, it only blew cold air at us. So, a call to the landlady, who came out, took a look, pushed a button (after removing the panel on the heater that says "Do not remove until the electricity has been shut off. You could blow up the house and/or electrocute yourself if you do"), and made it go again. Since she really didn't do anything, I was a little skeptical that it would solve the problem. And I was right. I awoke this morning to the sound of a futile furnace. Since it had been going earlier, the house wasn't quite so cold, but still. So, another call, to the landlady (I am sure she is getting really sick of us this week). A furnace repair man should be coming soon...Of course, all of this wouldn't be as big an issue if it weren't 19 degrees Fahrenheit, and snowing (well, not at the moment, but it was snowing earlier, and may snow again later). Last night we headed into Rochester to go to an alternative gift bazaar at the Unitarian Church. It was a lot like any other bazaar/gift market, but most everything there was locally produced, or at least fair trade etc. I didn't buy anything, except a cookie, but Benjamin did all his shopping for me. Yes, I sort of know what he got, but not exactly. It is a first though, he didn't wait until the week of Christmas to order something that won't show up until after... If I get done with the grout, furnace, and grocery store, I plan to head over to the little Christmas market here in Brockport. And we are going to a Christmas choral concert tomorrow night. I love this time of year.